Although rare, I had one of these experiences recently when eating out with work at a particular chain restaurant in Manchester city centre. Ordering a Thai Beef Noodle Salad I was looking forward to a meal that was packed with Thai flavours and 0sp vegetables. What was put in front of me was a dish of rather plain noodles topped with a steak and drenched in the most tasteless oily dressing you can imagine. As soon as we left the restaurant all I wanted to do was get home and recreate a low sp, flavoursome version of the dish for myself. I finally got round to doing it last week and the result was delicious and tasted exactly how I imagined the original should of tasted. It’s a great dish as its quick and easy to whip up and a really easy way to make a filling meal for 4 people out of only 2 steaks. There are a number of alterations that you can make to this dish if you want to lower the sp even further. If you omit the noodles the dish is only 5sp (334kals) per person. If you would like to make the dish for 2 people I would make the salad as below, split the noodles between four and keep two of the portions for a packed lunch the next day (otherwise you end up wasting half a packet of noodles). If you would like to make it for 2 and have a rump steak each it will be 12sp per person. Begin by making the dressing. In a small bowl mix together the lime juice and sugar until the sugar dissolves. Add the other ingredients and then combine using a small whisk. The peanut butter might take a few minutes to break down but it should end up a nice smooth dressing. Pop to one side. In a large bowl add all the salad ingredients and toss together. Pop to one side. Take the rump steak and using either a meat mallet or rolling pin, beat the meat until it is about 1cm thick. Season with salt and pepper. Take a griddle pan or frying pan, spray with 1kal and heat until a high temperature. Pop the steaks into the pan and cook for a few minutes on one side. Flip and then cook on the other side until cooked to your liking. For the last minute of cooking, pour over half of the peanut dressing. Pop the steaks onto a plate and let the meat rest. Add the noodles to the same pan with a little water. Fry until the noodles are piping hot (around 5 minutes) and then pour the remaining dressing onto the noodles. Fry for another minute and then pop the noodles into the same bowl as the salad ingredients. Toss together and then split between four bowls. 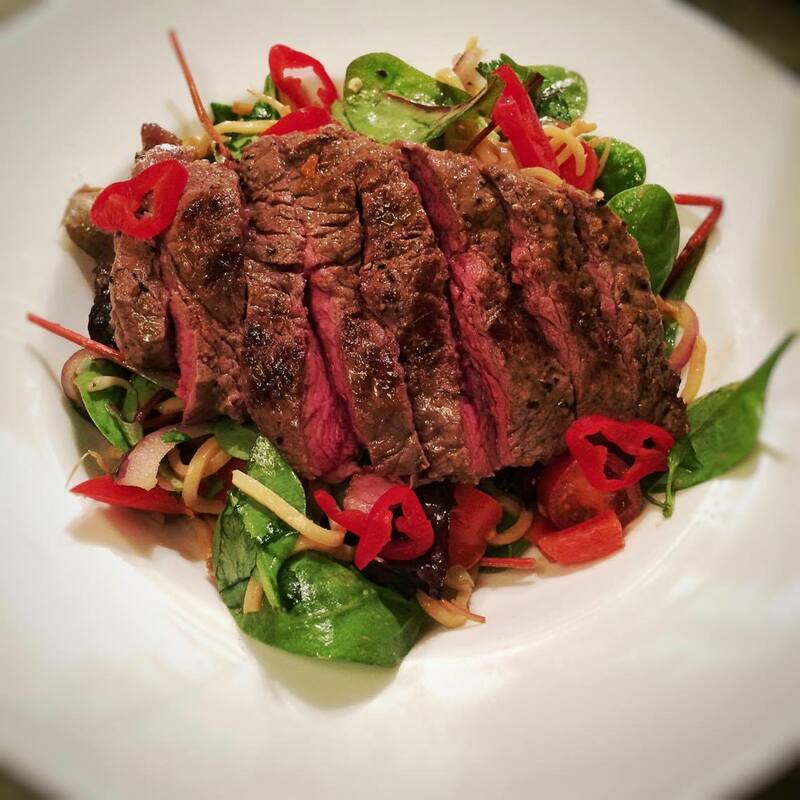 Slice the steak and scatter across the top of the noddle salad. Finish by scattering over the reserved chillies and coriander and serve with a quarter of lime.